The 500,000th person to visit the design museum was officially recorded on Saturday morning. The new V&A Dundee has welcomed half a million visitors through its doors - hitting the milestone almost six months earlier than expected. The £80.1m museum designed by Japanese architect Kengo Kuma, part of the city's £1bn waterfront regeneration, opened its doors on September 15. 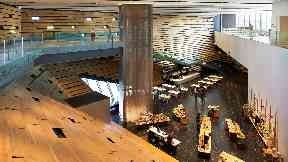 Initial forecasts were that it would take a year to reach half a million visitors, bosses said. The V&A Dundee said that surveys it has commissioned found that visitors are being attracted from beyond the Tayside region, with 36% from elsewhere in Scotland, 17% from the rest of the UK and 9% from overseas. Director Philip Long said: "It has been an extraordinary opening period for V&A Dundee and the support from visitors has surpassed all expectations. "Amazingly we have welcomed half a million visitors to the museum in a little over six months, our inaugural exhibition has been seen by almost 100,000 people and crowds of over 22,000 turned out to take part in our opening celebrations. "V&A Dundee is flourishing as a hub of creativity and learning and it's wonderful to see so many people enjoying it, with many returning time and time again. "This is just the beginning for V&A Dundee, and the dedicated team behind the museum will continue with our mission to enhance lives through design and to inspire as many people as possible to get involved." Dundee City Council leader John Alexander said it was an "incredible achievement" for V&A Dundee to hit the visitor milestone in such a short time. 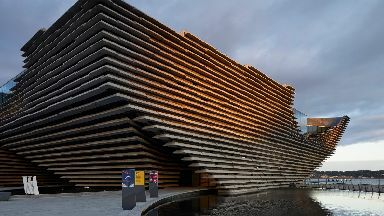 Scotland's Culture Secretary Fiona Hyslop said: "V&A Dundee is a powerful symbol of Dundee's new confidence and is not only raising the national and international profile of the city, but is increasing Scotland's attractiveness to tourists looking for world class cultural experiences. "It's fantastic to see V&A Dundee breaking visitor numbers six months earlier than predicted, showing the incredible success of this prestigious new attraction and that there is a real interest in Scottish design."